Sauerkraut has been around for at least a couple of thousand years. It was eaten by workers on the Great Wall of China, packed by Captain Cook to prevent scurvy, and valued by Northeastern Europeans as a staple food through the long winters. While the name may mean “rotten cabbage”, with this sauerkraut recipe, it should be quite the opposite, staying fresh for an extended period of time. 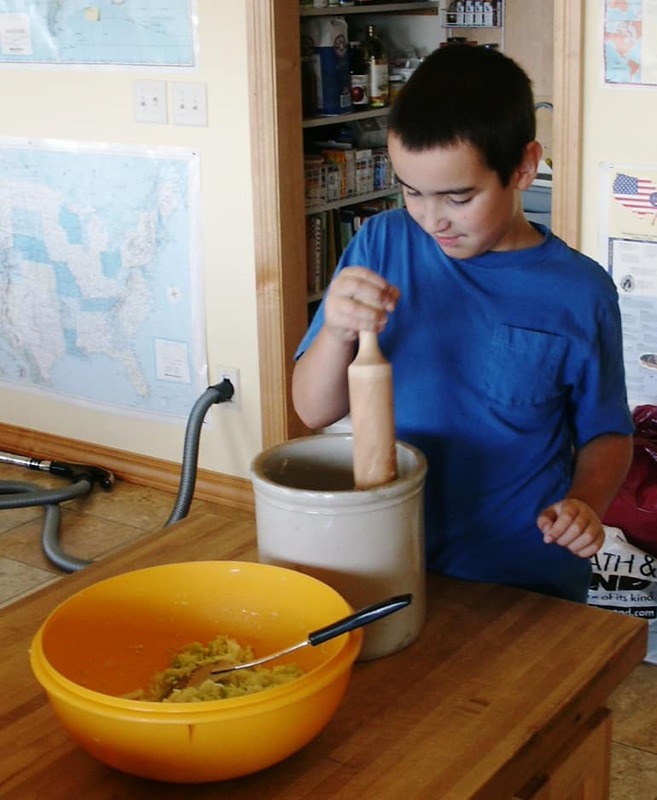 It's easy to make sauerkraut at home with just a few simple tools. Sprinkle salt on the cabbage as you go. 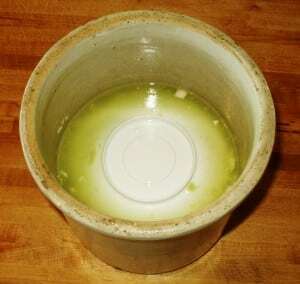 The salt pulls water out of the cabbage (through osmosis), and this creates the brine in which the cabbage can ferment and sour without rotting. The salt also has the effect of keeping the cabbage crunchy, by inhibiting organisms and enzymes that soften it. 3 tablespoons of salt is a rough guideline for 5 pounds of cabbage. I use more salt in summer, less in winter. Add other vegetables. Grate carrots for a coleslaw-like kraut. Other vegetables I’ve added include onions, garlic, seaweed, greens, Brussels sprouts, small whole heads of cabbage, turnips, beets, and burdock roots. You can also add fruits (apples, whole or sliced, are classic), and herbs and spices (caraway seeds, dill seeds, celery seeds, and juniper berries are classic, but anything you like will work). Mix ingredients together and pack into crock. Pack just a bit into the crock at a time and tamp it down hard using your fists or any sturdy kitchen implement. 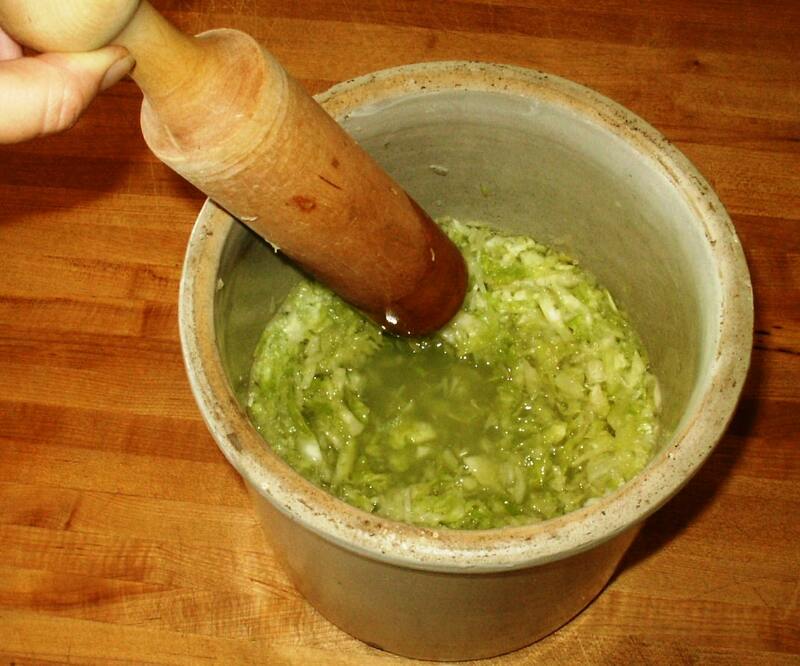 The tamping packs the kraut tight in the crock and helps force water out of the cabbage. Check the kraut every day or two. The volume reduces as the fermentation proceeds. Sometimes a white bloom appears on the surface. This is kahm yeast, and is harmless. Skim what you can off of the surface; it will break up and you will probably not be able to remove all of it. Don’t worry about this. It’s just a surface phenomenon, a result of contact with the air. The kraut itself is under the anaerobic protection of the brine. Rinse off the plate and the weight. Taste the kraut. Generally it starts to be tangy after a few days, and the taste gets stronger as time passes. In the cool temperatures of a cellar in winter, kraut can keep improving for months and months. In the summer or in a heated room, its life cycle is more rapid. Eventually it becomes soft and the flavor turns less pleasant. Enjoy. I generally scoop out a bowl- or jarful at a time and keep it in the fridge. I start when the kraut is young and enjoy its evolving flavor over the course of a few weeks. 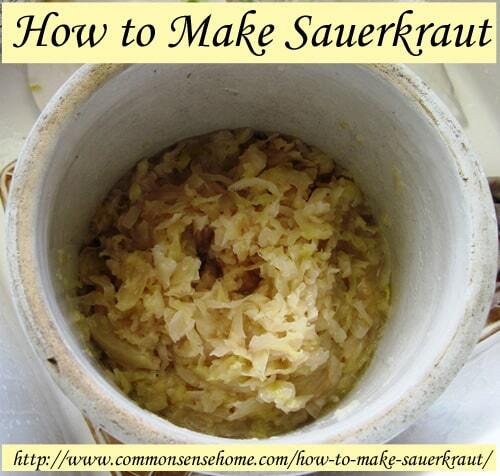 Try the sauerkraut juice that will be left in the bowl after the kraut is eaten. Sauerkraut juice is a rare delicacy and unparalleled digestive tonic. Each time you scoop some kraut out of the crock, you have to repack it carefully. 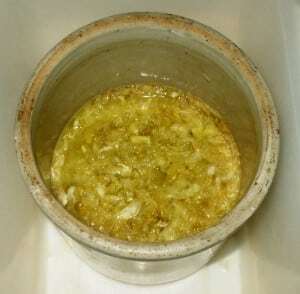 Make sure the kraut is packed tight in the crock, the surface is level, and the cover and weight are clean. Sometimes brine evaporates, so if the kraut is not submerged below brine just add salted water as necessary. We began our sauerkraut adventure with a couple of heads of cabbage from the fall garden. This post has a mixture of photos from several years. 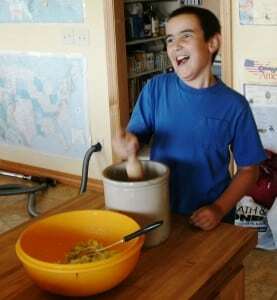 In 2009, I used my food processor to finely dice the cabbage. Sometimes, I use big knives. To make bigger batches, we borrow the kraut cutter from the neighbors. I did measure my salt out beforehand and add it as I chopped, as I am a novice at this sort of thing. Here we have my youngest helping me to tamp the cabbage into the crock. Really, he's normally a very sweet boy – see? With enough pounding, you get a nice layer of juice on top. I read another blog where the writer suggested simply leaving the cabbage to sit and letting it make its own juice, but that didn't seem to work with my cabbage. I didn't get enough juice to cover the top of the kraut. Put a plate on top to hold down the cabbage. Put a bag of salt water on top of the plate. In 2009 I just packed the crock with cabbage and salt. 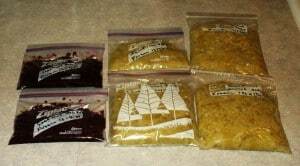 In 2010, I did one batch plain and one batch with added dulse (on the left with the red flecks). By the way, the container on the left is not ideal for a couple of reasons. The taper near the top made it impossible for me to fit a plate in to help hold the kraut down. It's clear, so I really need to make sure it's covered to keep out the light. Nevertheless, it was non-reactive glass and it was handy, so I used it. Can fermented vegetables be kept in the light? Well, if you had no other choice, yes, but light exposure speeds up the decomposition of the food (it will rot faster). Extended exposure to direct sunlight will kill off the very bacteria you're try to cultivate. Many vitamins are also broken down by the light. In this case, vitamin C, one of the main health benefits of raw sauerkraut, is broken down by exposure to light, heat and oxygen. Keep your ferments in the dark! This year's crocks are safely tucked under old towels in the basement cool storage after three days on the kitchen counter. Last year, I brought the batch up around mid-December to start eating. When I took the water bag and plate off, you can see the color of the kraut has darkened. I packed one pint jar for the fridge and froze the rest, along with some red kraut I got from a friend. As I understand it, freezing slows down the organisms responsible for the fermentation but doesn't kill them, so the kraut is still alive, unlike canning, where the whole goal is to kill any live bacteria in the product. 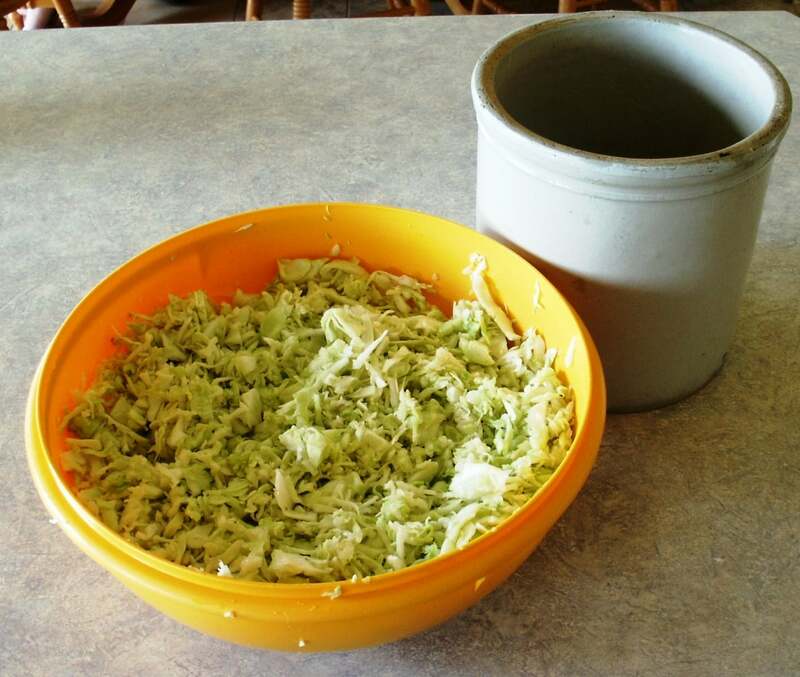 This season we borrowed the neighbor's kraut cutter and made a batch that was 3/4 green cabbage and 1/4 red cabbage. The kraut cutter was nice for making a larger batch. 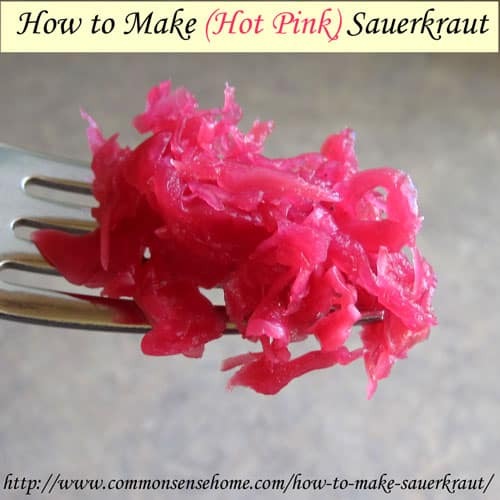 It aged from 10/23/2013 to 3/2/2014, and when I went to package it, I found we had a hot pink kraut. This is great for adding some color to your plate! What are some of the benefits of eating raw sauerkraut? The same beneficial microorganisms that create lactic acid in the colon are naturally present in all vegetables and are responsible for turning raw cabbage into highly-digestible sauerkraut. The fermentation process increases the number of microorganisms dramatically, digesting the cabbage and other vegetables and producing lactic acid. This lactic acid works the same in a jar of fresh sauerkraut as it does in our large intestine; harmful bacteria cannot survive in the acidic environment. When we eat unpasteurized sauerkraut we reap the benefits of absorbing an entire ecosystem into our own internal ecosystem. The lactic acid from the sauerkraut creates an environment where the introduced beneficial bacteria can reproduce and in turn create more lactic acid. Lactic acid also helps digestion at an earlier stage–in our stomach. As we get older, our stomach’s natural secretions of hydrochloric acid decrease. Hydrochloric acid breaks down food so it can be more easily absorbed by the small intestine. It is also the most important defense we have against harmful bacteria and parasites often present in food. Lactic acid can partially compensate for reduced hydrochloric acid. Another way unpasteurized sauerkraut benefits digestion in the stomach is by assisting the pancreas. The pancreas secretes essential digestive enzymes into the stomach. Unpasteurized sauerkraut is very high in viable enzymes that work just like the ones from the pancreas. A friend with chronic pancreatitis who has been taking prescription enzymes for the last five years was able to reduce his dosage by eating fresh sauerkraut on a daily basis. But this is just the beginning; there are so many more reasons to include my favorite food in your diet! I eat my kraut with my eggs in the morning for breakfast, or as a condiment with just about any meat (roast chicken being a favorite). It makes a most excellent Reuben. I hope this helps you take the plunge if you haven't tried fresh kraut. It's fairly easy and very tasty. What other veggies have you fermented, and how did you like the results? 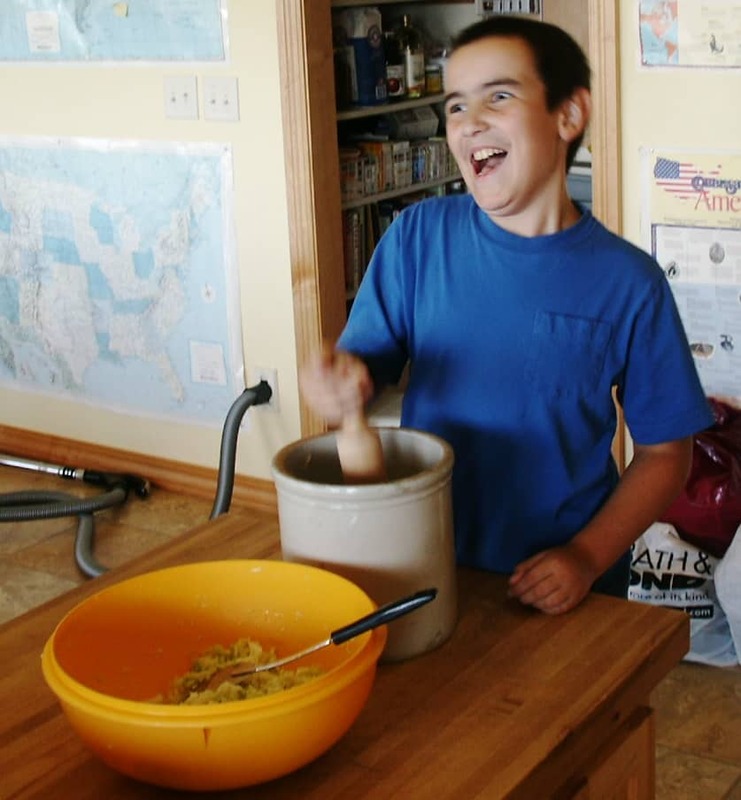 PS – I quick note on the “tamper” I used to pound down the kraut, in response to Patty's comment. The tamper is actually the wooden pestle from my Mirro Canning Food Press. The food press was handed down to me by my grandmother. I don't use it a ton since I got my food strainer, but it is handy for small batches of applesauce and such, and pounding on vegetables. Great post and pictures. Especially love the expression on your son!!! It's my goal to step up fermenting this winter and I already have a posting in mind for a little later. Found it fun to see so many of seem to have the same thought lines going. I made a batch two months ago but "harvested" it too soon and ended up tossing it in the composter. I now have another batch going, on Day 18. Here's the thing, though – I'm using those fermentation jugs from Cultures for the Health – the see-through glass with the air lock tops. You know the ones I mean? And I didn't realize you should keep it out of light, so it's been out in the light. Oops! Mine got the "bloom" which the air lock is supposed to help prevent, though I don't think it's guaranteed. And that's fine – I scraped it off, but am kind of worried about getting all of it off and trying to keep it from seeping into the brined part of it. This batch doesn't stink like my last batch did. It didn't smell rotten, mind you – just strong fermented cabbage! This batch has "mellowed." I think it may be ready, but now that it got moldy on top, I'm scared to try it! I don't know that you *have* to keep it dark/covered, but most guides I've seen recommend it. I think it helps to stabilize the temperature, keep bugs out, and is a "better habitat" for the critters we are trying to cultivate. There's really only one way to test it – give it a taste. If it's bad, you'll know, and can spit it back out. My first batch had a little bit of scummy stuff around the edges, which I just scraped off, and smelled quite strong. I was a bit nervous, too! The longer it ferments, the mellower the smell/flavor tends to be, until it finally goes bad (but that takes a REALLY long time if refrigerated). I have been wondering about freezing some kraut, so glad I found your post (via Kelly). I made it a couple of years ago and canned it…what a waste if it kills all the good stuff, huh? The last time I made it (with caraway BTW!) I moved it from the crock to 1/2 gallon jars and stored it in the fridge. I think it has been a year now, and I have 1/2 of a jar left and it is still good! I really want to do the red this year. Wish I had a cute "tamper" like you do! Patty, I had to put some kraut in the freezer as my fridge was too full. I like to mark the date on my bottles using a piece of masking tape written on by a Sharpie. Easy on, easy off, and no guessing about how old that thing stuffed in the back of the fridge may be. I write with a Sharpie directly on my canning lids and freezer bags. Laurie, thanks for the tip about freezing the kraut. I only make/eat it during the winter as that's when cabbage is in season for us, but it would be great to have it all year long. I'm totally going to do that this year. Also, I'm really the only one who will eat it regularly, so when I make a big batch, it'll spoil before it gets eaten. LOVE the expression on his face! Do you ever have problems with mold on the surface that gets into the contents? I have that happen quite freqently and then they go bad. I've thrown out my fair share of stuff this year. It sounded like you just put the bag on top then brought it up and there was no mold? I have a harsch crock and those crocks you have too plus I use mason jars with carboys screwed into the lid that we made. The carboys and closed jars seem to work best in terms of mold. I have a whole lacto fermentation carnival over on my blog too if you want to see some other things folks have linked up. Lots of great ideas there! Annette, I haven't had any troubles with mold, either in crocks or in mason jars with a lid, except for one batch of pickled cucumbers. I think that was due to a refrigerator malfunction – the basement minifridge had the door left open for an unknown amount of time. It was not good. Thankfully, it didn't have a lot in it at that point. I think our climate here is cooler and dryer, and I usually hold off on my vegetable ferments until fall. Last time a made kraut I probably removed less than 1/4 cup of "questionable" material from the top of the crock that was a little "off" in color. Thanks for letting me know about the fermentation carnival. I will take a look. Laurie, again, you amaze me with your talents. Featured you on Domestically Divine. Your strawberry kombucha rocks. 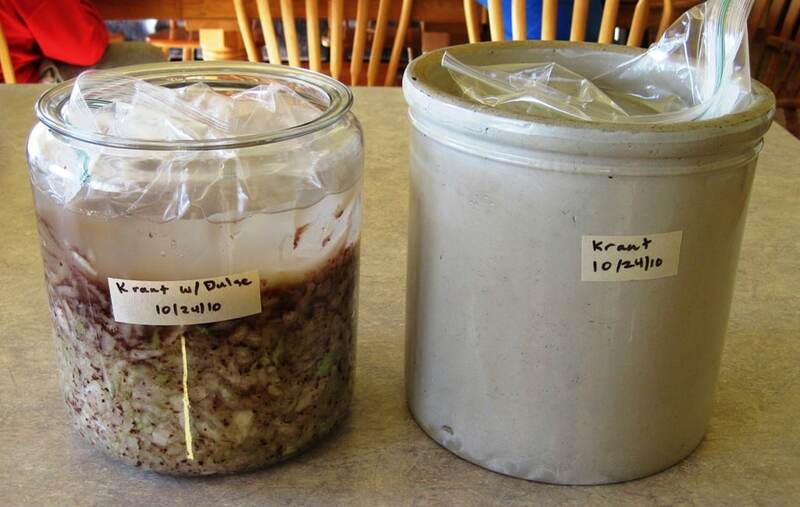 I made two batches of kraut last year – the first was just "off" – hard to describe. The second was WAY too salty! I made another batch this year and….not too bad! I used caraway seeds and it is pretty good. Very ferment-y tasting, but I think I like it. It's kinda hard to tell – I'm so used to eating the stuff from the grocery store which has such a mild flavor. And since I'm new at fermenting, I always worry about the process and whether or not I did it safely. But…I think I'm happy with this batch! Five Seed – one thing I've found with fermenting is that most people with functioning taste buds can tell when something is "off". With this type of fermentation, the worst thing that's likely to happen is that something rots instead of ferments, which will give a distinctive (unpleasant) aroma and flavor. 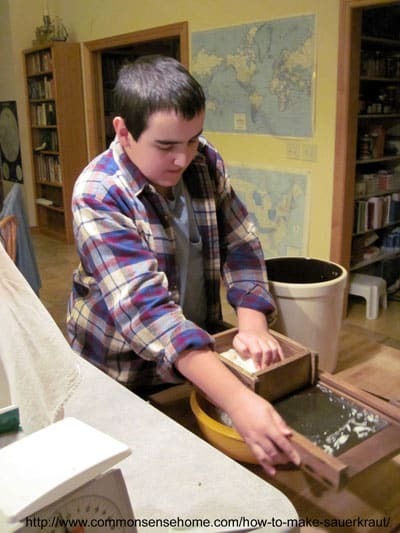 Properly fermented foods will smell musky and yeasty, but not nasty. If you're ever in real doubt, toss it out. If you're not sure, taste carefully in small amounts. I like the plate because it helps to ensure all the vegetable matter stays down below the brine level much better than the water bag alone. I found some nice little stoneware plates at a thrift store, too, so now I’ve got less plastic indirect contact with the food, which I prefer. I’ve tried for the last 3 years to make kraut. The first two was way to salty and turned a redish brown. Last summers kraut tasted good but it was mushy. I uses a box kraut cutter for cutting the cabbage. It was in a stone crock kept in the cellar. I removed the mold twice a week. Any ideas what I am doing wrong? What climate are you in? Temps have a big impact on how it keeps. It sounds like you’ve got aggressive mold growth, and a true airlock system like the Veggie Master or Harsch crocks sold by Cultures for Health may give you better results. You’re looking for an oxygen free environment to breed the correct bacteria. Other fermenting container include the Pickle It and Fido jars(http://www.amazon.com/gp/product/B0001BMYH0?ie=UTF8&camp=1789&creativeASIN=B0001BMYH0&linkCode=xm2&tag=commosensehom-20). When I made kraut I used the below jars (straight sided or wide mouth) and filled them about an 1″ from the top. Placed plastic baggies with a couple of soup cans(full) inside the jars flipping the rest of the baggie over the rim then put a rubber band around the rim over the baggie making sure the plastic was a bit loose so the cans could sink. The brine rose right to the top with out too much manipulation. Then I placed them in a brown paper bag with a pan to catch any leaks. It prevented the scum from forming on the tops of the kraut and made it easy to check on it too. Most recipes I have seen simply call for mixing the juniper berries in with the kraut. For 5 pounds of cabbage, try 1 tablespoon of berries and adjust to taste with subsequent batches. Should be uneventful, just working to finish harvesting the garden. Winding down, but we’re still not done. Dug onions today and will dig potatoes tomorrow. I happened upon this post while on pinterest… I have my first batch of sauerkraut in the works. My crock is like yours but bigger, I was able to fit 4 heads of cabbage in it. It’s been fermenting for almost 4 weeks and I’m seeing everything you have described, however, my husband is complaining of the smell… he wants me to get rid of it. I’ll admit, it does smell pretty strong. Is that normal? It is in the corner if my kitchen… so the temperature is probably 72-74*. I was planning on canning it, especially since I have so much, but now I’m thinking maybe I should freeze it instead! Thanks for the great information. You’re welcome. It will smell like fermented cabbage, which can be pretty funky, and at normal room temps, the fermentation is probably humming right along. Odds are, it’s just fine, but probably ready to be moved into cooler temps or long term storage. You can certainly can it or freeze it, or both – your choice. As I mentioned, freezing puts the bacteria in stasis instead of killing them. That said, if you plan to use it mostly cooked, the bacteria will end up getting cooked anyway. In the process of making my first batch of sauerkraut. It’s already 2 1/2 weeks along and seems to have passed through the first stage ok. Bubbled lightly for less than a week. Haven’t observed anymore bubbling or have had to spoon out scum residue. That was minimal. Smells pretty good. Not strong or foul. I’m using the water bag method to hold a clear crock lid down on top of the cabbage so I can see through to the top of the cabbage. Looks ok, too. I keep a towel over it all. Temp of the contents has been about 70-72°. In the meantime, I’ve had to check it every other day because of water evaporation. Missed it for 3 days, checked today, the level was down almost all the way to the top of the lid but thankfully no air reached the top of the cabbage. After I added more brine to top off, it occurred to me; Water is evaporating but not the salt. Wouldn’t you think that the more brine you add, the higher the salinity would get over time? Then that started me thinking that maybe the brine is too salty possibly halting the fermenting process? Would it? I’m adding about a cup or more of brine every other day. All these variables! hmmm…..you might have an easier time of it with an enclosed fermenting vessel to virtually eliminate evaporation. Around here, our humidity is so high I haven’t had ever had to add water. In the grand scheme of things, having a little more salt really shouldn’t be a problem, but if you feel that you need to add a large amount, a weaker brine should be okay. Well, I’ve been planning this since last fall but one thing or another got in the way. I suppose I could have done it without the weights. I think, I am ashamed to say, I was afraid to try it. Why? I have no earthly idea. But I just completed it minutes ago. That feels incredibly good…to face something and complete it. Thanks for sharing with us Laurie. It makes it easier to try new things. You can ferment just about anything, as long as you watch your pH and salt levels. People have even fermented whole heads of cabbage. I admit, I haven’t been a terribly adventurous fermenter to date, but there are lots of folks who are. I’m filling out mortgage refinance paperwork tonight, but I’ll hunt down a couple of my favorite fermenting reference books and post them tomorrow. 24 hour update: no juice. So I added salt water to cover after applying some pressure and mashing on it a bit. Anybody know what a failure looks and smells like? I highly recommend pounding the snot out of the cabbage until you get juice. See above crazed photo of boy with pounder. In all my years of making kraut, I’ve never failed to get enough juice to cover. If you truly have a failure, it’ll start smelling rotten, not fermented, and mold bloom and off colors are likely. Thanks Laurie. Pounding to commence momentarily. Silly question, but how do you work this stuff into a meal? Like a garnish or small salad? Most of the time I’ll add a couple of tablespoons and eat it like a condiment. The acidity makes a nice complement to proteins and fats. I was wondering..does cooking the sauerkraut diminish the nutritional benefits? Yes. Once you cook the kraut, it will no longer be a live culture food, and heat damaged vitamins like vitamin C will be reduced.